One of the interesting aspects of military history, throughout the ages, has been the match-up of commanders. Two single people, each commanding a mighty army, "meet" on a battlefield and decide... something. They very seldom actually "meet," of course, and crossing swords has almost never happened. But the battle of wills, of ideas... the conflict of strategy and the execution of tactics inspired by just two people can be fascinating. But, throughout history, it is hard to find a battle (and campaign) that sees the individual clash of PERSONALITY in a more important way-- a decisively important way-- than the clash between Darius III of Persia, ruler of the largest empire in the world-- and a young man named Alexander, who ruled a small, semi-backward nation and a collection of Greek states where he had only recently had to suppress rebellion. The odds? 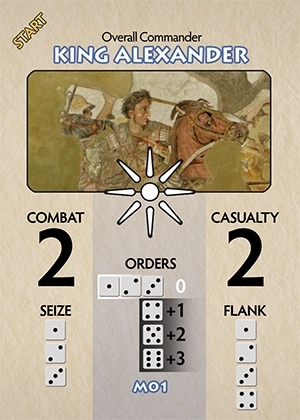 Best modern estimates put them at something worse than 5-1 against Alexander. His 47,000 troops are fairly well documented. Darius commanded something over 250,000 (although some accounts place the figure much higher). At times like these, the smaller force generally picks favorable ground for a defensive battle-- except Alexander always liked to attack and this was Darius' chosen battlefield, with room enough to deploy his masses, and ground carefully smoothed to improve the performance of his hundreds of chariots. Alexander's commanders SUGGESTED a night attack, but he refused... which didn't stop Darius from keeping his army in their battle lines all night, expecting the attack that never came. When Alexander attacked, he personally led the force that broke the enemy line, coming close enough (it was said) to throw a spear at Darius and to challenge him to personal combat. Darius had none of it and fled. His army was doomed, and so was his reign. And the empire of Alexander was begun. John Keegan tried to give us real perspective on Alexander's achieve- ments. He asks us to imagine Bonnie Prince Charlie not only suc- ceeded in taking back Scotland, but he then conquered the rest of Britain and Ireland, then France and Spain, on across Europe, knocking the Russians out of Poland and Ukraine, and was threatening the Ottoman Sultan when he died...just ten years after the campaign began. 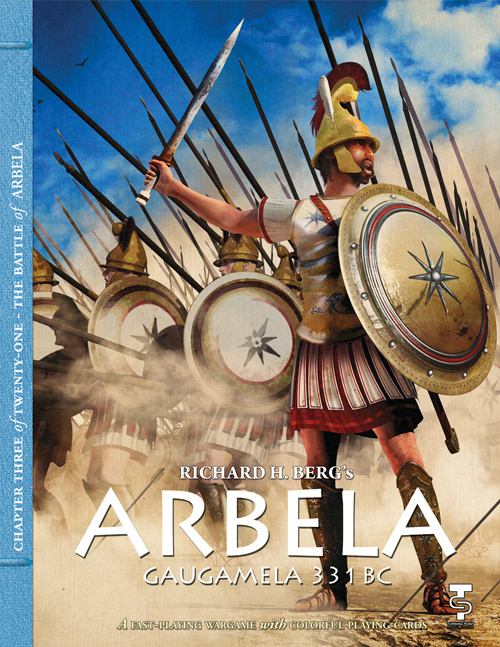 And Arbela is his most important battle. 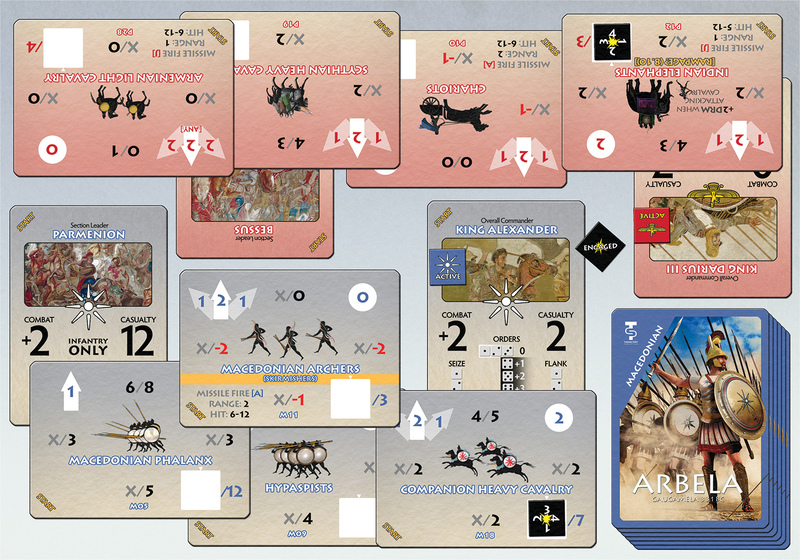 Now, TPS lets you explore this critical battle in an innovative, card-based system designed by Richard Berg. 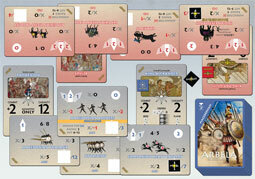 This is not a "card-driven" game, but one in which the units themselves are large, colorful cards that capture the abilities and appearance of the two armies. And NO mapboard in the traditional sense! Game options include a "historical" deployment or allowing you to "do better" on your own. Replay value is very high! 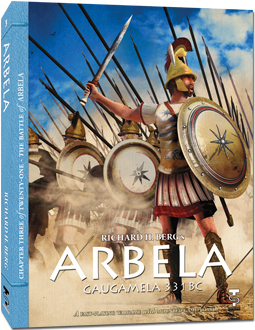 Put your "personality" to the test and see how you fare, at Arbela!